Before any work starts, your dentist will first invite you to his or her office for a consultation. At this visit, you’ll be thoroughly examined to make sure that you are a good candidate for the procedure. The professional will primarily be looking at your current jawbone mass to see if there is enough healthy material to support an implant. Once it’s determined that you’re a good candidate, you’ll proceed to the next step. 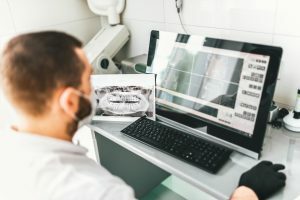 Your local professional will use special software in conjunction with bite impressions to pre-map your treatment process. The 3-D imaging will provide a “top-down” visual that will help your dentist determine the precise placement of the dental implants. Additionally, the software will provide an image of the final restoration that will be attached, allowing the clinician to perform a more accurate insertion. Another advantage of the advanced technology available to your dentist is digital implant selection. It allows for the identification of the correct size of implant for the particular tooth to be replaced. This is important because the procedure has to recreate the natural spacing and fit of your teeth for the implant to seat properly. Not only does the latest technology help to prepare for the dental implant procedure, it also aids in the placement surgery. It will help your dentist in Oklahoma City determine how your oral cavity will accommodate the new implant and provide the right environment for healing. Patients are able to have more peace-of-mind in knowing that the procedure to replace their teeth involves no “guesswork.” By your dentist remaining up-to-date with the latest breakthroughs in computer-aided pre-planning and surgical procedures, you’ll enjoy an accurate and efficient restoration. Soon, you’ll be back to eating, speaking and smiling with confidence. To learn more about the possibilities available for you, reach out to your dentist in OKC to schedule an appointment today. A graduate of the University of Oklahoma College of Dentistry, Dr. Joe Isaacson has been helping patients restore their smiles and full function of their teeth for the past 25 years. An award-winning dentist, he stays abreast of the latest technological advancements in the world of dentistry to ensure that his patients receive the absolute best care. Dr. Isaacson can be reached for more information about his services through his website.